Is the Facebook/Cambridge Analytica a one-off event or does it represent a much wider problem across the ‘promotional’ industries such as public relations, marketing and campaigning? Lee Edwards, Associate Professor at the LSE Media and Communications Department argues that there is a growing ethical problem that threatens democracy. Recent revelations about Cambridge Analytica’s strategies and tactics have caused shock and outrage, in part because we want democratic processes to be just that, democratic. Decisions arrived at through popular suffrage – the next government, the decision about whether or not to leave the European Union – are ideally based on people’s rational, evidence-based opinions rather than manipulated emotional drivers such as fear or prejudice. And yet, the CA files show that presenting evidence and engaging citizens in high quality debates around key issues may be a minority interest for politicians. On the contrary, the quick and easy route to power now involves deploying emotional arguments online, via promotional techniques that make the most of our vulnerabilities and encourage us to avoid, rather than engage in debate. Responsibility for these distortions has been laid at the door of technology companies who should be protecting our personal data more effectively. The leaders of Cambridge Analytica, their funders and their collaborators all need to start answering the accusations levelled against them, and the pressure on them will only increase as the extent to which our privacy has been invaded and our identities abused becomes clearer. Yet, the roots of this scandal do not only lie in the unfettered ability of data-savvy organisations to access and use our information without scrutiny. On the contrary, in societies soaked in promotional culture, Cambridge Analytica’s work is the thin end of the wedge that industries such as public relations, advertising and marketing have managed to insert into all areas of our lives – politics and commerce most of all. 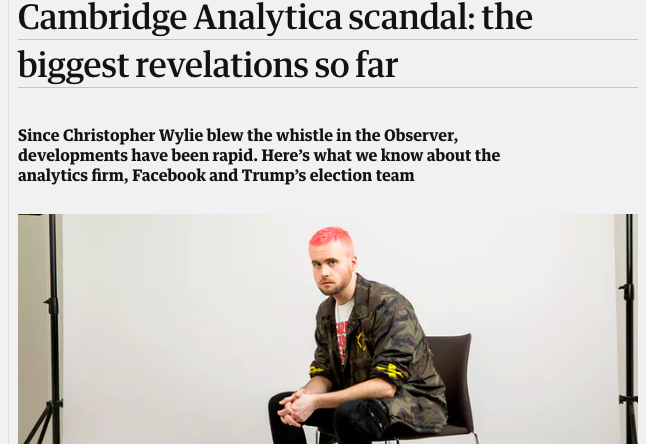 Cambridge Analytica: symptom of a wider problem? Histories of public relations and advertising in the UK and the US show that promotional professions have long struggled to control our opinions and behaviors to serve political ends. The advent of the internet, as Joseph Turow’s excellent analysis has shown, simply moved this struggle online. Big Data is the holy grail for marketers attempting to manipulate our choices. Moreover, promotional logic – the normalization of promotional techniques as primary tools for persuading the public to support organisations and individuals – provides the link between Cambridge Analytica’s operations and the prevalence of fake news online. As Jason Cabanes and Jonathan Ong note in a recent study, advertising and PR executives are often implicated in the distribution of fake stories – and this, too, has been a hallmark of PR practice for many decades. Arguably, then, the origins of the current scandal lie not in lax oversight by Facebook, or in the amorality of Cambridge Analytica and its clients, but in the histories of promotional industries that have normalized the idea of manipulation in their professional practice, while marginalising ethics and the public interest. Given this, one might expect the promotional industries to be doing a bit of soul-searching. Not so. A search for the company on industry association websites reveals precious little comment on the story at all. Where it does appear, the focus is frequently on Facebook and the challenge for the brand, which has lost trust and reputation. If Cambridge Analytica does appear, its work is framed as a ‘dark’ art, overstepping ethical boundaries. The desire for distance is palpable. This avoidance of self-scrutiny also characterized the industry’s response to fake news in the early part of 2017. In an analysis of the PR industry’s responses to concerns about fake news that I presented at a recent conference, responsibility was placed squarely on the shoulders of tech companies for allowing fake news to circulate unchecked; distributors of fake news were presented as unethical and outsiders, while practitioners were encouraged to seize the opportunity to help journalists in their quest for truth by acting as a reliable source of quality information. Once again, the history of an undesirable practice was erased in order to make the present more palatable. No promotional practitioner or organization would deny the importance of ethics, but at the industry level, there is precious little enforcement. Codes of ethics are ineffective. Penalties such as expulsion from an association does not stop unethical practice – only clients running from a sinking ship can do this, as Bell Pottinger discovered last year. But whether it is data mining, fake news or the simple fact that manipulation is the basis of practice, these industries must start to think more carefully about the consequences of accepting unquestioningly the tools of their trade. More importantly, regulators must start to turn their attention to the power that these industries wield. Arguments for self-regulation appear weak at best, in the current climate.